Clickworker is a well-established crowdworking platform. Using their website you can earn money by completing small tasks and surveys. Let’s take a look at the new Android app. They’ve had an iOS application available for a while. Now they’ve also got an Android app. In this post we’ll look at the new application, how to get it and I’ll also write a short review. First, let’s take a look at the money-making process you need to go through if you think this is an opportunity for you. 2 Is getting the Android app worth it? Complete ‘assessments’ in your members area to ensure you see the maximum amount of jobs available to you. Install the app (instructions below). Get into a routine to check the website/app regularly. 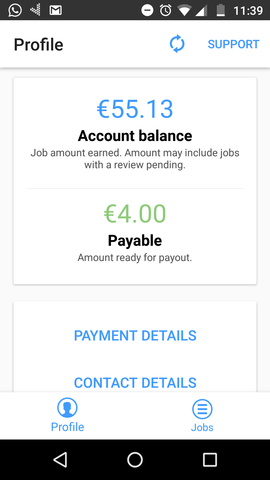 Start earning and get paid weekly using Paypal. Is getting the Android app worth it? I’m a big fan of Clickworker and over time have made good money using their website on my desktop. For that reason they’re always one of the money-making methods I recommend people to check out and see if it’s for them. As an Android smartphone user I’ve never been able to use the app though. Potentially meaning lost earnings compared to iPhone using members. That’s no longer a problem thanks to the launch of the new app. Is it worth downloading or is using the main website via a laptop or desktop PC better? My personal preference will always be to try and earn through a desktop. The same goes for all websites. Lots of survey sites also have apps and you nearly always find the desktop version of the website is far better. I expect the same to happen with the Clickworker app. I think having the app is worthwhile though. If nothing else, seeing it on your smartphone screen may remind you to login to the desktop version and look for tasks! It’s free and only a small file size so it can’t do any harm. That’s my viewpoint. 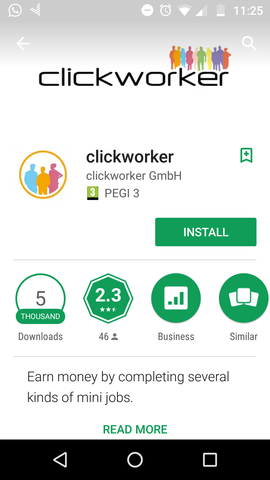 Once you’re a member of Clickworker you have a choice of ways to download the app. You can either login to the members area via your desktop/laptop and click on the “Mobile App” link in the menu. Or you can go direct to the Google Play Store on your smartphone and download it from there. If you go via the “Mobile App” link in your members area it will show you QR codes to scan on your phone and direct links to both iOS and Google Play. Here’s the link to the Google Play Store listing. Here’s how it looks. Hit the ‘Install’ button in the app store to get it onto your device. It was very quick to install on my Moto G5 device. You can then go ahead and open the new installation and login with your username and password. Once logged in you’ll see your main profile and your account balance. Here is how mine currently looks. In the menu at the bottom you’ll see the ‘Jobs’ button. Click that to see the current list of jobs available. That’s all there is to the app. They’ve done a good job of keeping it simple. If you’ve got any questions about Clickworker they may be answered in our forum area. Having downloaded the app and started using it. Here is my initial honest review of it. The design and layout is great. They’ve done a really good job, it’s nice and easy to use. Unsurprisingly there are a lot fewer jobs available via the app compared to what I see on my desktop. That will always happen for technical reasons. Inevitably this will lead to lots of negative reviews in the app store. People always do that. Rather than read Clickworker explaining there will be fewer jobs via the app and then accepting that, they just steam ahead and post 1-star reviews. Ignore them. Those people are not using their brain. The good thing is those people will go ahead and uninstall which leaves more work for the rest of us, awesome! I’ll stick with using the desktop version for now. Purely for the fact it will give me the most money-making opportunities. But I’ll keep the application installed and check it from time to time. I’d also like to see how it progresses over time and whether more and more jobs become cross-device compatible. I hope this article was helpful. Thanks for reading. This is just one of the ways included in our 100 Ways list. Please check it out for more methods to improve your personal finances.